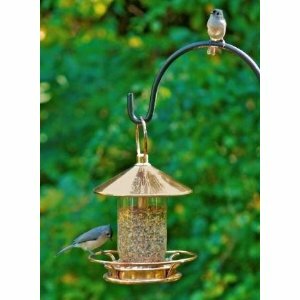 Our choice of metal bird feeders, unique bird feeders and other best backyard bird feeders that will delight you and your wild garden birds. I love beautiful polished copper bird feeders which are bright and shiny to start off with, but age beautifully over time to a soft green color. Copper, and other bird feeders made of metal, are a unique addition to both your back or front yard, and they will attract birds to have a snack while you can enjoy their company. When you buy a metal bird feeder, make sure that you are getting real metal and not a metal finish or plastic coated with a metal colour. Choose a size that suits your needs - a smaller feeder is better for smaller birds, but choose a bigger capacity if you have many feathered visitors. Check to see if the hanger or pole is included in the package. If not, you may need to purchase a hanger of your choice. As with all backyard bird feeders, make sure you clean regularly. 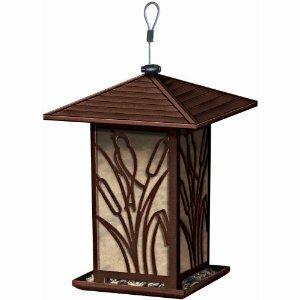 If you are looking for a smaller metal bird feeder that is attractive and reasonably priced, you should try this one. It looks smaller than you might think it would. And the perches are narrow, but if you want to cater for smaller birds like finches and nut hatches, and keep the starlings and pigeons out, then this bird feeder might be the one for you. 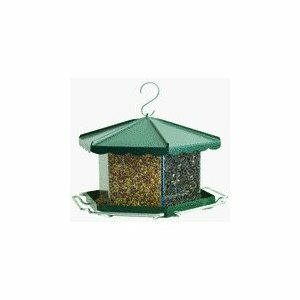 The Triple Bin Bird Feeder comes fully assembled and with easy mounting instructions. I like the removable 3 compartment acrylic bin which holds up to 3 types of feed to attract different birds. The see-through sides allow you to see when the feeder needs filling. Being made of heavy duty galvanized steel, it does not absorb bacteria and mold. Another bonus is that the seed flows easily - your birds will always have food as long as you fill it. This metal feeder is easy to clean and the large capacity means that you won't be filling it every day. The birds love the perch that is provided around the base of the feeder. It is a very sturdy feeder and should last for years.